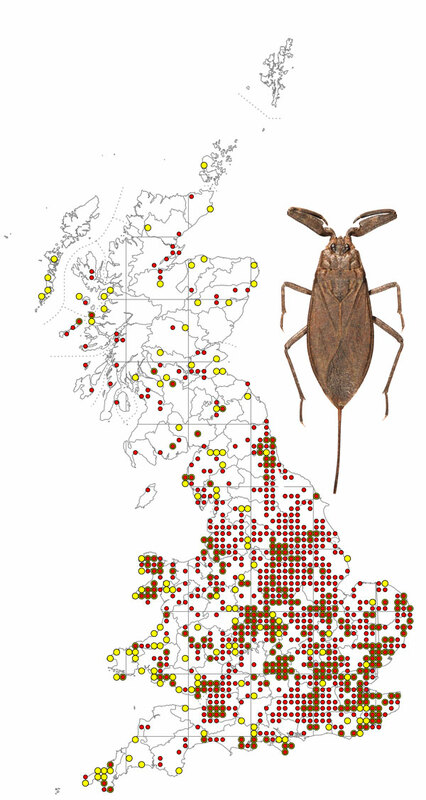 Nepa cinerea, the Water Scorpion, is a widespread species occurring throughout the UK in a variety of aquatic habitats, but usually in shallow water among vegetation. It overwinters as an adult and mating occurs during April and May. Eggs are laid in vegetation just beneath the surface of the water and take 3 to 4 weeks to mature. Nymphs pass through 5 instars (growth stages) and give rise to adults by about mid-August. N. cinerea is a predator and uses its powerful front legs to catch small fish, fly larvae, the larvae of other water bugs and many other aquatic animals. The scorpion-like tail is a harmless breathing tube which acts rather like a snorkel in shallow water habitats, carrying air to the spiracles on the abdomen. Fully developed hind wings are present beneath the wing cases and N. cinerea is able to fly to new habitats, but most individuals are incapable of flight because of under-developed flight muscles. Variation in wing muscle development is fairly common in bugs and other insects and depends on the benefits of migration versus the benefits of using the energy that would have been used on flight muscle for other purposes, such as reproduction. Identification of Nepa cinerea is straightforward as it is such a distinctive species. It is about 2 cm in length, 3 cm including the tail. The only other member of the Nepidae found in Britain is the water stick insect, Ranatra linearis.